Your end-users are the weak link in your network security. Today, your employees are frequently exposed to advanced phishing attacks. Trend Micro reported that 91% of successful data breaches started with a spear phishing attack. You need to strengthen the weakest link in your IT security. A survey showed that “end-users” wound up at the #2 spot of “System Admin Hate Votes” right after “no documentation”. And indeed untrained end-users generate tons of support tickets. 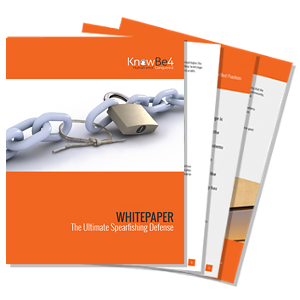 This whitepaper explains the problem of spear phishing and how Advanced Persistent Threats use this attack vector against organizations with devastating consequences. The paper is great ammo to support your request for budget so you can deploy an innovative and effective way to do security awareness training and cut down on those support tickets.